Plaque is a very common condition. It is a fairly soft layer that consists of a combination of living and dead bacteria, calcium and phosphorus from the saliva, food remains and water. Dental plaque preferably develops along the gums, but can also occur in places where the natural cleansing is less. 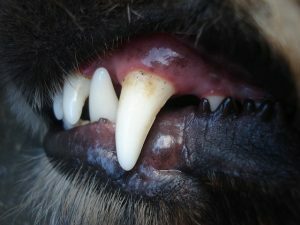 the shape and construction of the teeth have an important role to play in this. There is also an individual predisposition for the formation of dental plaque: one animal suffers from it more quickly than the other and also the severity and consequences can vary per animal.